At Truman State University, Environmental Studies is available to students in a variety of ways. The Environmental Studies Interdisciplinary major is the most common of the interdisciplinary majors. An official Environmental Studies Minor is open to all students as well. 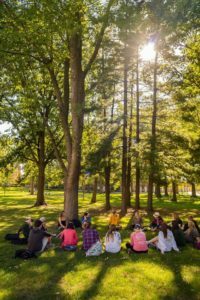 Each semester, various departments offer environmentally focused courses as special topics that can be included as a part of a traditional or interdisciplinary major, or Environmental Studies Minor. Internships and scholarship jobs are also great ways for students to engage in environmental studies during their time at Truman. Interdisciplinary Studies Major: If you are interested in taking a large step towards a greater understanding of environmental issues, you can declare and Interdisciplinary Major in Environmental Studies, Sustainable Development, Sustainable Agriculture, Environmental Policy, Environmental Ethics, or any other sustainability-related field. To be eligible you must enroll in the IDSM 175: Introduction to Interdisciplinary Studies course and design your major program under the helpful guidance of an Interdisciplinary Studies Professor. Your major will then be approved by the Interdisciplinary Studies committee or sent back for further revision. For more information on the major program, you can visit the Interdisciplinary Studies Major web page or contact the Director of Interdisciplinary Studies, Dr. Bridget Thomas at ois@truman.edu or swing by her office at McClain Hall 332. Environmental Studies Minor: If you want to complement a traditional major with a 15 hour interdisciplinary minor centered around environmental issues, then the Environmental Studies minor program is the place for you. Students are able to design their own minor curriculum by choosing courses from 7 different categories, including community learning, science, social science, and arts/humanities. For more information about the courses and requirements in the Environmental Studies minor program, click here. For general information on the Environmental Studies minor program, visit the web page or or contact the Director of Interdisciplinary Studies, Dr. Bridget Thomas at ois@truman.edu or swing by her office at McClain Hall 332. For-Credit Internship and Learning Experiences: Check out our Internships page to learn more about opportunities to receive credit hours for your hands-on internship experiences. Internships can be proposed to your department chair to receive credit hours as well. Lastly, the Grassroots Environmentalism (ENVS 380) and Sustainability Practicum (ENVS 470) courses are service-learning and hands-on. Students from any major may take these courses.